Wantage & Grove Street Pastors patrol the streets of Wantage and Grove aiming to care, listen and help those in need. We patrol in small teams of volunteers on Friday and Saturday nights throughout the year. If you see us out and about, do come and say hello; we’re always happy to chat to people we meet. We’re often able to help with practical things such as water for the thirsty and flip flops for those who have given up on their shoes! We often care for people who may have had too much to drink or perhaps have been separated from their friends. We sometimes find people that benefit from being able to talk about their lives and the things they’re going through. We’re always happy to spend time with people who just need someone to listen to them. Sometimes we’re able to direct people to organisations that may be able to help them further, if they wish. As Christians we are always happy to pray with anyone if they would like us to. We’re definitely not there to preach to anyone, but sometimes we find that people who face situations that are bigger than them appreciate a moment of prayer. We’re happy to pray with people on the streets or contact our prayer team who are available to pray whenever we are on patrol. 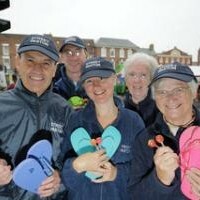 If you would like more information about Wantage & Grove Street Pastors, do contact us.